After I bought my 98, I thought I'd hit it with Auto-RX, since I heard so many good things about it. I'm 1200 miles into the 1500mile cleaning phase now. Soon I'll be in the rinse phase. Here's a pic of the oil filler. As you can see, there is some buildup. Will post my finding after the 2000 mile rinse phase. Might have to do another treatment. I'm extremely fearful of those Shock Flush products, like Gumout Engine Flush, as I've read they can really screw up the engine or even kill it. Sounds good - please let up know how it comes out. Also be interesting to see if the oil filter is clogged with crud (if there is an appreciable amount of gunk in the motor). That build up of gunk on the valve cover is not too bad - I've seen worse build up and the car was still OK.
wow, i thought my 7afe had varnish! the 'gunk' i can see in my valve cover is just a thin film of light brown that actually can be mostly wiped off with a rag. Looks like some build-up, but I have seen worse as well. Let us know if you get it cleaned up. Well, I finished the 'cleaning' phase at 1500 miles and started the rinse phase. Oil looked darker than usual for only 1500. I was going to cut open the filter, but didn't want to mess with it. It didn't look really badly gunked up. The Auto-RX folks say most of the sludge will be liquified anyway during the rinse phase. Will take pics at the end of the 2000 mile rinse and post here. The end result will tell if it really worked on not. Interesting to see if it is worth the time and trouble to use. There really wasn't alot of trouble involved. Just the cost of it, and the additional oil/filter change. I suppose to a really objective analysis, I should have pulled the valve cover off before and after. I didn't mind trying it since the guy who invented it claims its the safest stuff on the market..so no harm in trying it. I didn't mind trying it since the guy who invented it claims its the safest stuff on the market..so no harm in trying it. now what would he possibly have to gain by saying that? im sure he stands to gain nothing by lying. Well, I'm 1000 miles into the 2000 mile cleaning phase. I'll have to snap some pics of the oil filler to compare to the 1st pictures. I think either I'll need a '2nd' treatment, or I'll have to step up to a more powerful desludge..like Neutra 181..but it's really hard to get ahold of. Anybody know where I can get some, besides a case of 24 bottles from a distributor? It has been awhile since your last post on this topic. Could you provide an update? Do you think this helped? Well, Anything I notice is completely subjective, but it seems to run a bit smoother. Mileage is the same. My rinse phase has another 300 miles to go, so I will post here what the 2000 mile oil looks like when I change it. OK i've changed the 'rinse' oil. Only 100 miles shy of the 2000 mile mark..mainly because the weather was in the 50s today in the middle of December ( Average is the low 30s ). Here's the results of the Auto-RX treatment. Well, Auto-Rx is better than nothing at 'cleaning' sludge from the crankcase, but since my observations are completely subjective I have nothing to really go on. This is probably a bit more effective than just running a 1/2 qt of ATF fluid in the crank for 100 miles, but the price is ~$25 a pop makes it an expensive solution. It certainly didn't do any harm, as the manufacturer points out in their website, but effective with just one dose? I'll probably have to do another dose to actually see something conclusive. 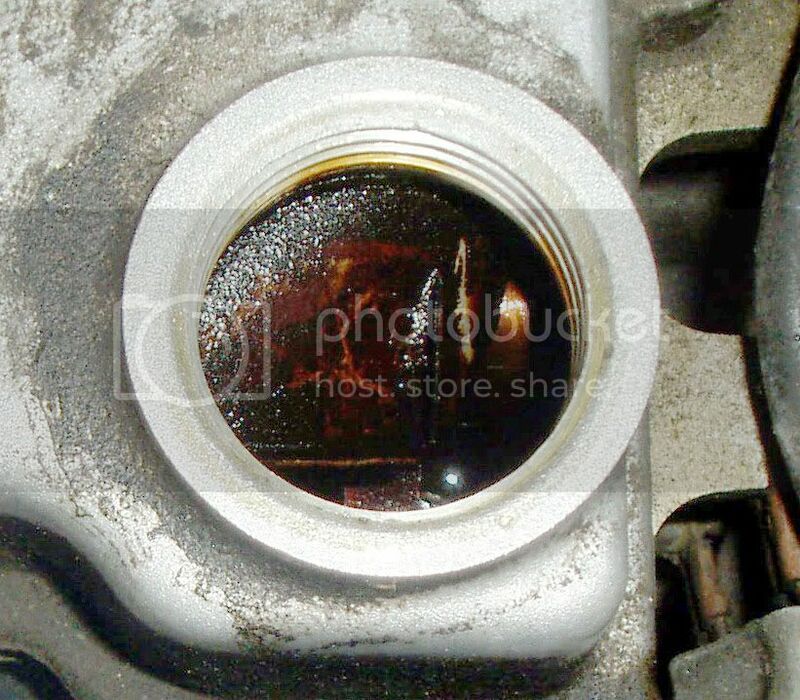 Hmm - hard to tell from the pics, but that sure is some pretty dark oil you drained out after ~2000 miles + Auto-Rx. Without sending it in for analysis - I found that using some plain coffee filters with some drops of drain oil makes for good comparison if something happened there. As the oil percolated through the filter media - it will leave the heavier materials close to the drop point and move outward. I'll try and dig up some photos that I had with some comparisons a while ago. I used a cycle of this stuff on my Jeep a while back and I thought I noticed a difference as well. The drained oil looked a bit darker and the inside of the valve cover was slightly cleaner. it looks only a little lighter than 3000-3500 miles and 1/2qt of ATF. of course ive never popped my valve cover to look under it to see how clean it is or isnt. this spring/summer i'll be doing some maintenence and changing the tbelt i'll also pop the top and take a look under when i put on a new vc gasket.